Probably the most popular matching game since Puzzle Booble, this time with a new version improved both the visual appearance as in gameplay. The game consists basically in combining same color gems to get them to explode and disappear from the screen to avoid reaching the end of their trip. Special spheres will give us different powers to improve our performance and get more gold coins. At the end of each level we have a special challenge that will change as we move forward in the game, becoming more complicated each time. The music and graphics are excellent and transport us to ancient times without distracting us from the game itself. A particularly addictive game, once you start you can not stop. 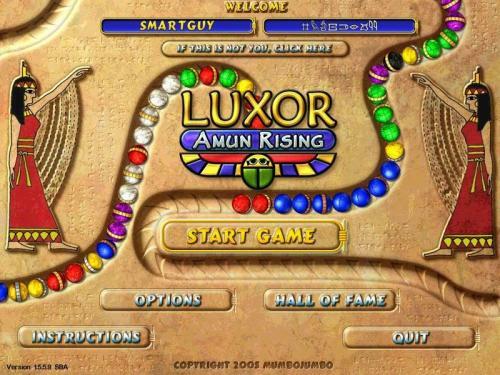 Luxor download now from our servers free of spyware, adware and viruses. Wait no more! Downloads Software informs that Luxor 3 should be only used in accordance with the rules of intellectual property and the existing Criminal Code. The inclusion of any keygen, serial or crack is not allowed and disclaims any liability for the inappropriate use of this software.